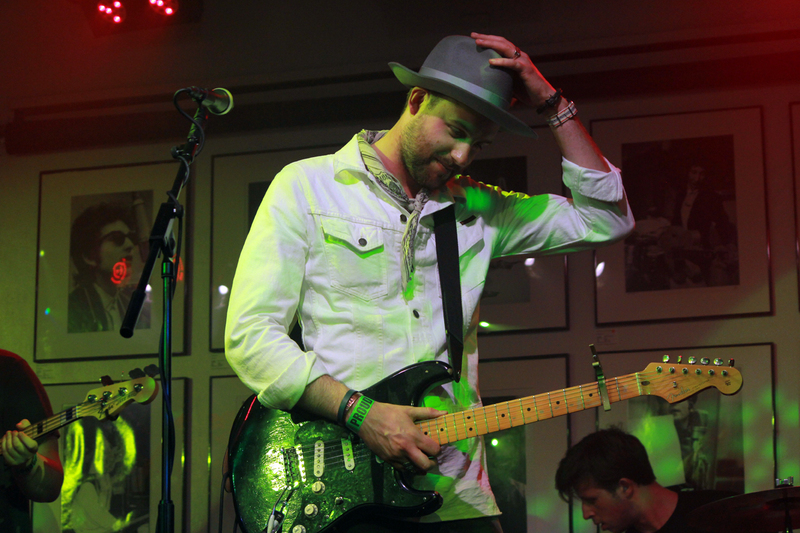 London based Swedish singer-songwriter Axel Jansson brought his band along to Venue last Friday, as the latest act to play as part of the weekly Coffee House Sessions. Brig’s Scott Paterson caught up with Axel after his impressive set. So Axel, your debut single Shine A Light was released recently, how would you describe that song? Well, I actually wrote that probably two years ago and the inspiration behind the song is, sort of, obviously I’m Swedish and I moved to London like five years ago and when you make your first big move in your early twenties, it’s sort of a big thing. You start to, quickly, when you move away learn more things about life, it gets tougher and tougher, it gets more serious. When I wrote Shine A Light, it’s all about living where we are now and enjoying life, it’s so easy just to look back at the good old times and that sort of stuff, so enjoying where you are now. There’s a lot that things will never be the same, you’re always looking back and maybe you should enjoy where you are now otherwise you sort of miss your life, in a sense. How have you enjoyed the Coffee House Sessions so far? I know this your last day. Yeah, it’s been great. We’ve had such a good time, I want another week! It’s just a great opportunity for up and coming artists. I think there’s, not a gap in the market, but there definitely needs to be more of these sort of tours organised because I think you meet a lot of people, you reach out, you get a good response, it’s personal, I think it’s good, yeah I’ve had such a good time. You get to see the UK as well! Do you have any pre-show, or post-show, superstitions that you do, or anything you like to do before or after a show? Before, I wanna take care of my voice before the show, so nothing too spectacular or anything. But afterwards we usually go out and have a nice dinner, find a nice place, I’m a food lover (laughs) so it’s nice to celebrate a little bit, but nothing too weird or anything like that! I would definitely say like 60s/70s rock music, like Springsteen, Bob Dylan, Neil Young, Tom Petty, all of those great singer/songwriters. Even if you listen to our songs, you maybe can’t hear it straight away, but I’m very inspired by blues music as well, that’s usually what I listen to everyday so I find inspiration there. But then also you need a modern touch, so it makes it fun. Probably the last one, Blue and Black. I think we have a good version of that as well and obviously with this tour we do the acoustic and then the main thing is the full band, I love playing that song both acoustically and with a full set up. During your set there you covered Ellie Goulding’s Love Me Like You Do, have you got any other covers you like playing, other than that one? Recently I’ve been playing just for myself, I don’t usually play a lot of covers when I perform, but I’ve been playing quite a few Ryan Adams tracks, I’m a big fan of his, but maybe other than that there’s always going to be a few Springsteen songs I do and some Dylan songs but I’ll probably just ruin them (laughs). That’s the thing with those sort of things! How do you tend to promote yourself, get yourself out there, do you use social media and that sort of thing? Yes, especially when we did the first release, we really had to step that one up, to build a profile and we’ve got some good PR on board now over the last few weeks and they’re going to continue working with us. The live scene is a big thing, you know, because all of the technology has changed the business, it forces the artist to really promote. You know, live culture, it’s gigs and everything, I think that’s a big part of it as well, pushing hard there. Now, what are your plans for the rest of this year? Well, we’re going to follow up this release now, back it up with possibly a second release at the end of this year/beginning of next year – early January or something. It’s gonna be a single or EP, I’m still deciding. I think it’s a case of just taking the next step, when you release, you still have to top that up with something else, it’s always going to be the next thing. But obviously I’m very excited about the new songs, they’re still very fresh to me. What can we expect from your new tracks? Well I think the sound is probably going to be more or less the same, but even if some songs are maybe different from genre to genre a little bit, I think as long as you’ve got your own sound, you’ll be good, you’ll be fine. What are you listening to right now, any modern stuff, anything new? The album I’m listening to at the moment is actually Ryan Adams’ new album, he covered Taylor Swift, I love that record! It’s so good, really, I listen to that a lot. What else? There’s actually an Italian artist, I’ve got this Italian friend who showed me this guy, apparently he’s massive in Italy, I’d never heard of him before and he only sings in Italian, I adore his music, but I don’t understand it! And finally, last question, where do you see yourself in about five years time? Hopefully on a bigger tour, possibly in like different territories as well, like America or all over the world, Japan or something, I dunno, but definitely to be on the next sort of level, that’s what I’m aiming for. Jansson’s Shine A Light is available to hear and buy on YouTube, Spotify, iTunes among other outlets now. Coffee House Sessions continue this week as Ady Suleiman comes to Venue at 1pm on Friday.